Easy to make raw carrot cake truffles that are vegan, gluten free, refined sugar free and most importantly delicious. No bake cake balls that are suitable for a raw food diet with a cashew cream frosting. Maple syrup is heated but contains nutrients so is generally accepted as suitable for raw foodists. 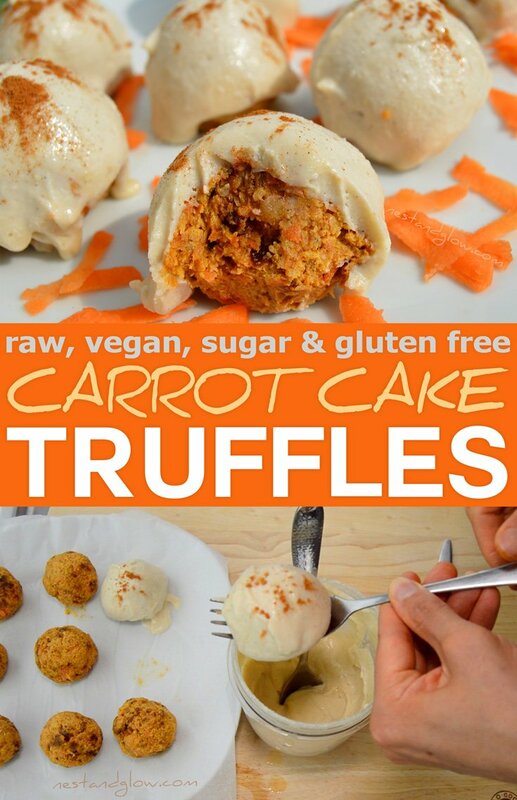 Be sure to use gluten-free oats if you don’t eat gluten when making these raw carrot cake energy balls. Full of healthy fats, fibre and protein – you can have your cake and eat it with this healthy cake! The chia seeds can be replaced with either flax seeds or more oats, they help set the raw cake balls. Chia is high in heart-healthy fats, omega-3, calcium and protein so ups the nutritional content. Did you know that up until recently chia seeds were only legal in Europe to add a small amount to bread. If any brand dared to put a recipe for chia pudding on the packet it would have been illegal! Despite chia existing for thousands of years and being a staple of the Incas its an ingredient that was previously unknown of a few decades ago in the west. If you would rather have one big carrot cake than truffles just press the base ingredient into a pan and top with the icing. It’s slightly quicker to make it as a cake. If you don’t have coconut cream / butter you can replace with coconut oil or just leave out but the icing will not be as firm. Cashew cream frosting is easy to make even in an inexpensive bullet blender and is smooth and creamy. Vanilla is expensive but it’s really worth it in my opinion in this raw carrot cake. I would rather have something with proper vanilla once a week than artificial vanilla every day. In the video I used fresh vanilla pods for a rare treat but a high-quality extract is a good halfway house with great flavour and not too expensive. Did you know vanilla comes from the orchids of genus Vanilla and originally came from what we now know as Mexico and Guatemala. The pods are picked when still green and blanched in hot water then left to sun dry for months. It’s the second most expensive spice after saffron and 80% of the world’s supply comes from the island nations of Madagascar and Reunion according to Huff. Put all of the base ingredients for the raw carrot cake into a food processor and pulse blend until they are all combined. The mixture should be firm, if not add more oats. Either roll into balls for truffles and place on non stick sheets or push into a cake pan for one big carrot cake. Place in the freezer to chill while you make the icing. Melt the coconut cream/butter/oil as its solid at a room temperature. I melt by placing in a bowl within a bowl of hot water. Place all of the carrot cake cashew frosting ingredients into a blender with a few tablespoons of water. Blend until you get a smooth creamy icing. Hold the carrot cake truffles on a fork over the icing and spoon on the cashew vanilla bean icing. Then sprinkle with cinnamon and put on a non stick sheet. For the cake just pour the icing on top and spread it out. Sprinkle with cinnamon / grated carrots / chopped nuts to garnish. Once the raw carrot cake balls are made chill in the fridge for half an hour and they are ready to eat. Raw carrot cake will last several days stored in the fridge. If you like this recipe check out our Tropical Lemon Cake. Did you use a Nutribullet to blend? It looks like it. I find it is much easier to use because it is so easy to clean, but don’t want to mess up the recipe if you feel it won’t work as well. The icing does not thicken up like the pictures here. The recipe also makes double the icing of what is able to be used. This was so tasty, thanks so much for the recipe. The icing is amazing, it is a bit soft if its taken out of the fridge and left but still amazing – just a bit messy! What is coconut cream? Not coconut oil, not coconut butter, something else? Thanks. Hello, it’s a block of solid coconut fat (http://www.biona.co.uk/product-272-4.html). Sub for coconut oil or butter. I won’t be using it again for a recipe as lots have got confused by it! So Just use 1/2 cup coconut oil? Not coconut cream or milk right? That’s right yes, just use coconut oil or creamed coconut – a solid coconut fat. Plenty have made it from the solid cream at the top of a can of coconut milk and said how great it was. I cannot have any oil- what is sub for coconut oil in the frosting?? Anything that will thicken it is good. Cornflour works, but you will need to heat it. Or if you don’t mind it sloppy (it will still taste good) use some banana. Add as little water as possible and grind the cashews first so you don’t need as much water. Do the calories apply to only one carrot truffle? in the recipe it calls for coconut OIL and in the video and the instructions it said coconut CREAM. Which do you use or can you use both? Also is it cream from a can? No, cashews and macadamias are the only nuts I don’t soak – unless I don’t have a powerful blender. This cake is amazing!! Thank you for sharing with us. I like your page! While I appreciate the effort in making healthy dessert options, the cost profile is just not feasible for many. In Canada, 150 gms of Organic Cashews is $6.46 and 150 gm of Walnuts: $9.99. Just these 2 ingredients bring the cost of this dessert to $16.46. That IMO is a pretty expensive home made dessert. Many plant based/Paleo recipes use expensive nuts (walnuts/cashews) as the main ingredients. I just don’t see how this can remain feasible for the average person/ family. I understand that there should not be a price put on health, however, altruism aside, realistically, there is. Sorry. My comments are not intended to offend. The recipes are great!! Perhaps you could suggest some cost friendly tips and alternatives? Hi Lenore, I do see what you are saying. I’m living on savings with a few dollars a day coming in from running this site full-time. So I certainly know what it’s like living on a tight budget! Organic nuts are certainly out of my reach at the moment. Using standard nuts and the cheaper less premium grades make this recipe not particularly expensive in the UK. The cheaper grades often are not perfect aesthetically and in smaller pieces but it doesn’t matter for this recipe. Hello I think there is a mistake in the recipe you wrote coconut oil and in the video it’s coconut cream! My icing was awful because I put oil instead of coconut cream!! Hello Fabienne, there’s some inconsistencies in different countries what is coconut cream. I’ve tried to explain this in the recipe, but obviously it still needs some work! If you use oil it should be fine. What went wrong? Was it too soft? It didn’t look like your icing: white and creamy. It was with a strange colour and too fat. I put some coconut cream with 90 % coconut milk extract to save . It was better after. I will do it again better later. I continue to be your fan!!???? I keep seeing your recipes and they all look deliouse and can’t wait to try some. I’m on a diet called acid watchers diet and I have celiac disease so these recipes are great for me. The only ingredient I can’t have because of the acidity is lemon which is bad for acid reflux. If I omit the lemon from the recipes do you think the recipe will still work out and be tasty? Sure, it works great without lime it helps balance the flavour but it’s fine to leave out ??? ?